The supraorbital, infraorbital and mental nerves all line along an imaginary vertical line drawn through the pupil.When injecting in the mouth, provide topical anesthetic, retract mucosa to enhance vision & minimize needle insertion trauma, dry the injection site, and penetrate mucosa using distracting pain to minimize the pain of injection. Watch an introduction video identifying nerve locations on the face. The supraorbital nerve exits the superior surface of the optical rim from the supraorbital foramen. The Supratrochlear nerve exits out of the medial portion of the orbital rim just superior and medial to the lateral canthus. Blocking both of these nerves will provide anesthesia to the entire forehead up to the vertex of the scalp. Prep and drape the area just superior to the eyebrow(s). Inject topical anesthetic into the subcutaneous space in a plane just superior to the eyebrow from the midline to the lateral edge of the orbit. The infraorbital nerve exits the infraorbital foramen just inferior to the anterior portion of the optic rim, and just cranial / superior to the first maxillary pre molar (just posterior to canines). The maxillary premolars can be identified by remembering that the Central incisors are your front two teeth, Lateral incisors are just that, followed by the Canines, two Premolars, and finally three Molars. Infraorbital nerve provides sensation to the lower lid, medial cheek, the side of the nose, and the upper lip. The inferior alveolar nerve gives rise to the mental nerve which exits the mental foramen. The mental nerve block provides anesthesia to the labial mucosa, gingiva and the lower lip adjacent to the incisors and canines. Identify the first and second pre-molars on the lower jaw. Retract the lip, apply topical anesthetic, and dry. Advance the needle inferiorly into the mucosal fold adjacent to the first and second pre-molar. At approximately one centimeter, inject 3 to 5 ml of anesthesia. The inferior alveolar nerve arises from the mandibular division of trigeminal (V3). Identify the mandibular sulcu the cornoid notch and the pterygomandibular raphe. The failure rate for injection is 15% to 20% in the most experienced hands, and the rate of positive blood aspiration is 10% to 15%. 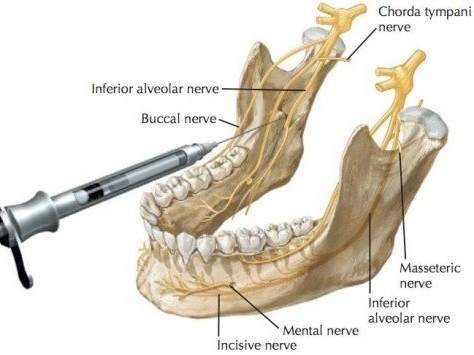 The inferior alveolar nerve provides anesthesia to all the lower teeth and gums from the retromolar region to the midline as well as the anterior labial and lingual areas. The lingual nerve is usually affected by the inferior alveolar block; therefore patients may experience difficulty speaking after this procedure. Retract the lip, apply topical anesthetic and dry the mucosa. With the non-injecting hand, place the thumb inside the mouth in the coronoid notch of the ramus. The needle should be directed from the contralateral lower incisor to the medial aspect of the ramus. Insert the needle 1 to 2 centimeters posterior and medial to the thumb in the raphe. Advance the needle until you gently tap bone and withdraw approximately two to three millimeters. Inject approximately 2 to 3 ml of anesthesia slowly.